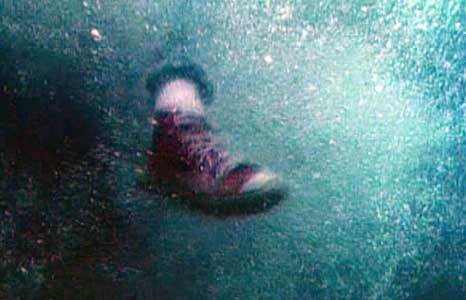 Tarek McCarthy wears red high top Converse “Chuck Taylor” All Stars in the film. Maria, their dad Tom, and Klim wait for Michael and Willie to arrive. Maria (Bettina) is a teenaged Nahkut Indian living in the Pacific Northwest islands, who has been troubled by a series of dreams about her great grandfather, who was a tribal shaman. Her grandmother Jimmy Jim (Marie Antoinette Rodgers) encourages her to explore her cultural heritage and not forsake the traditions of their ancestors. Jimmy Jim tells Maria that she is the hope of their next generation and gives her an ancient amulet. Their ancient ways and lifestyle are under attack, not by any kind of war, but by land developers. Bob Hawk (Tony Acedo) is a greedy tribe member who has no desire to preserve the ancient ways and customs when there is a dollar to be made. He is working with a wealthy land developer to persuade the Mahkah tribe to sell 80% of Spirit Island, their ancient burial grounds, so that a modern hotel and resort can be built there. While some of the elder members of the tribe are opposed to the project, especially Jimmy Jim, most of the tribe is willing to go along, encouraged by Hawk to get their share of the money that the new resort will bring them. Maria and her grandmother Jimmy Jim tell Klim about discovering the prow to his great grandfather’s canoe. Meanwhile Michael (Brandon Douglas) and Willie (Gabriel Damon), two kids from Chicago, come out to visit the islands and go camping. Their father is an old friend of Maria and Klim’s dad Tom (Nick Ramus), and he wants them to experience the beauty of the islands. Brandon is about Maria’s age while Willie is a year or two younger than Klim (Tarek McCarthy), Maria’s younger brother. At first there is some cultural shock to get over with. Brandon is not used to a life style where there are no fast food places and video games, while Willie is surprised that Maria and Klim wear jeans and not full Indian headdresses and that they drive in a truck instead of riding horses. Klim delights in teasing Willie with bogus Indian stories that he makes up, and Maria wonders if Michael and Willie think that all native Americans live in teepees and scalp people. But soon they get to know each other, and realize that they have more things in common especially after they go to a tribal picnic. As a result of a dream she had, Maria has discovered the prow to her great grandfather’s canoe, and it is placed on the new canoe that was being readied for the four kids to go camping. The new canoe, after being dedicated in the old ceremonial way by Jimmy Jim, is loaded on Toms large power boat and the four go off on their camping trip, with instructions to meet them in three days. 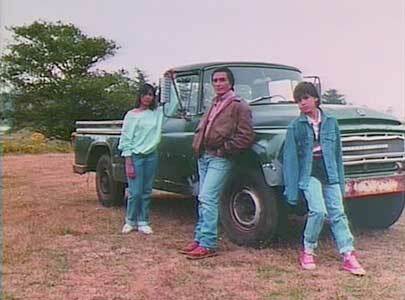 The four kids see Spirit Island up ahead. The kids have a good time camping and exploring around, but while they are racing their inflatable kayak with the canoe, a hole is ripped into the side of the kayak, and the four are forced to the shore of the nearest island, which turns out to be Spirit Island. Maria, who had a foreboding before they began their trip, now openly wonders why they were brought there. It doesn’t take them long to find out however. The next day, Hawk and his helper come to the island, with the intent of making it ready for the real estate deal to go through. To make sure that there are no government protected eagles nesting on the island, they go shooting after any nests and birds they spot. And they also intend to destroy any burial grounds that are on the part of the island that is to be leased to the resort. When the four kids see what Hawk is up to, they try to thwart his plans. Klim impulsively goes to grab Hawk’s motorboat, but is captured when Hawk sees what he is trying to do. The others create a diversion to rescue Klim, and their adventure accelerates as Hawk and his henchman, who are armed, chase after them, eventually trapping them in a cave, and blocking the entrance with a large boulder. At first the four are very frightened and worried that they won’t be able to escape. But then Maria begins to understand what her dreams really meant and takes a leadership role in figuring the way out. Their efforts to escape from their predicament, discover the importance of Spirit Island to the Nahkut tribe, and warn the rest of the tribe about the true intentions of Hawk make up the balance of the film. Klim is captured by Hawk and his henchman. Journey to Spirit Island presents a pretty simple story with a predictable plotline, but works because the focus is kept mainly on Maria’s coming of age story and the adventures that she has with her brother Klim, Michael, and Willie. While there is an underlying theme of the exploitation of native Americans, it is presented as something being handled within the societal structure of the Nahkut tribe, rather than just as an intrusion of the white man. It might seem obvious to some people that the only right way to go is to continue to observe the spiritual traditions of the past, but this is not obvious to everyone in our modern society and is a common dilemma today for many people struggling to survive. Their are similar stories in other parts of the Americas, where we hear of developers wanting to build over cemeteries. The true issue isn’t just the burial grounds so much as it is the preservation of a pristine area of great beauty. And another point seemingly made in the story is that in any society there are both good and bad people and you should look into yourself and your motivation to see where you belong. Regardless of where the viewer stands on these issues, there is great pleasure in just observing the land and seascapes of the Canadian Pacific Northwest that are constantly on display in this film. 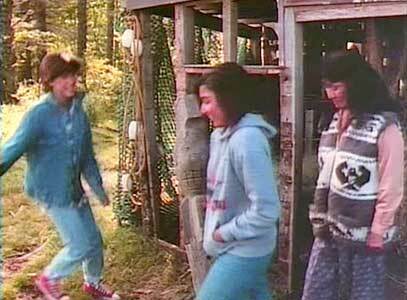 The final beauty of this film is that you see native Americans portrayed in a sympathetic manner and as normal people. This is quite a far cry from the gross stereotypes that were often presented in western and other action/adventure films of the past. While her exhausted companions rest, Maria goes out and finds their canoe. Klim and Willie get ready to jump into the underground lake. Tarek McCarthy, in his role as Klim, the young Nahkut teenager, wears red high tops throughout the film. Red chucks fit his personality in the film as an active, implusive, risk-taker, and they look great in the camera work by renowned cinemaphotographer Vilmos Zsigmond. 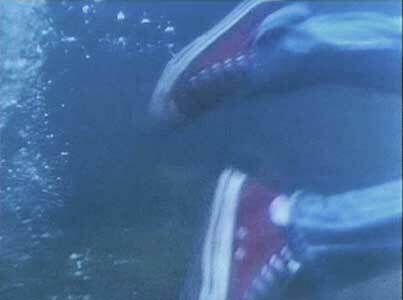 The action sequences in the film again show us that chucks are versatile shoes to wear in all types of terrain and in or out of the water. 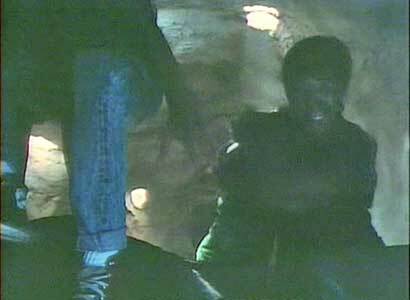 The best scene for closeups in the film is when Klim and the others must jump into an underground pool to escape the cavern that they are trapped in, and you see him swimming by. Klim jumps into the underground pool and swims out to safety. Journey to Spirit Island. (1992) Bettina, Brandon Douglas, Gabriel Damon, Tarek McCarthy, Tony Acierto, Nick Ramus. Directed by Laszlo Pal. Categories: Adventure, Family.